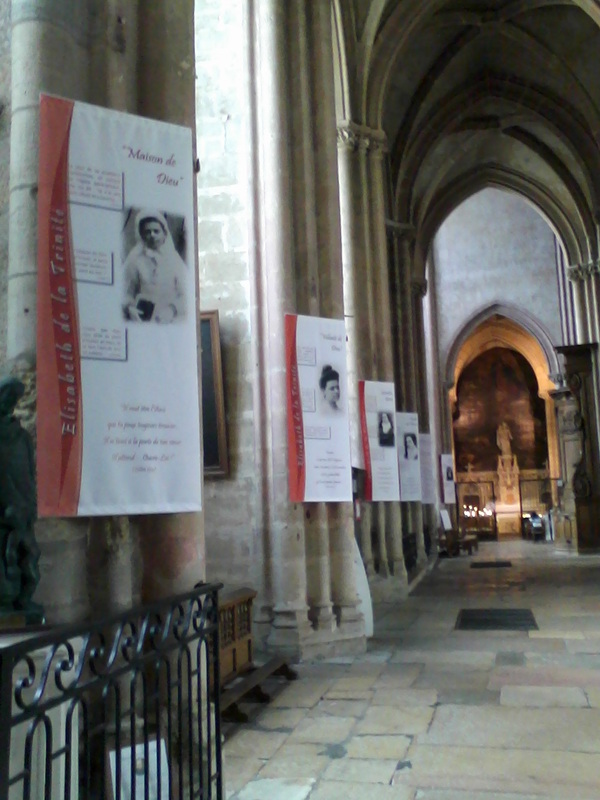 With this notice I'm sending you a wonderful gift from the prioress of the Dijon-Flavignerot Carmel, Sr. Marie-Michelle of the Cross: She sent these seven files with the banners the nuns had made for St. Michael's Church in Dijon (see the photo in file 1), where Elizabeth worshiped until she entered Carmel and where her major relics now are. The nuns had these banners printed on canvas in a large size (2 m x 80 cm). Sr. Marie-Michelle said that they could also be printed in any size, as well as on paper and as posters. She gives permission for them to be used far and wide. She wrote enthusiastically, "We hope that they will help make known Elizabeth and her 'God who is all Love.'" Sr. Marie-Michelle wrote that the nuns designed these banners to emphasize the main aspects of Elizabeth's journey and message. Each banner has a photo and a few quotations which illustrate one particular aspect. At the bottom of each banner is another quotation in italics relating this aspect to us in our lives. These banners are also available in Spanish, in Portuguese, and of course in French. Also about "Saint-to-be" Elizabeth of the Trinity, there is a new photo album in French which I highly recommend to you: Sainte Elisabeth de la Trinité: Rayonner Dieu by Fr. Didier-Marie Golay, OCD of the Paris Province. It was just published at the end of September by Les Editions du Cerf. Although the text is in French, there any many new photos, memorabilia, and works of art about Bl. Elizabeth which make this book a treasure. You can order it directly on line, but it is not available on www.amazon.com only on the French website: www.amazon.fr. With air mail postage, the book costs 42 euros, or $47. Finally, we wanted to share with you this flyer about the "National Mass Celebrating the Canonization of St. Elizabeth of the Trinity" at St. Therese Church in Alhambra on Sunday, November 6 to be broadcast live on EWTN.